After the fall of the Roman Empire, Italy came to be ruled by the Lombards, who originated in southern Scandinavia. Then the Holy Roman Emperor Charlemagne conquered northern and central Italy (including Etruria/Tuscany) in 814, establishing a new Kingdom of Italy. The Margraviate of Tuscany was established as a sovereign state in the Holy Roman Empire in 846. It was ruled by several families, including the House of Lorraine and the House of Arles, which provided several Kings of Italy. Its last sovereign was Matilda, Margravine of Tuscany, known as "the Great Countess," who personally defended the Papacy, leading troops into battle. She died without issue, and the territory was willed to the Papacy. Eventually the Holy Roman Empire Kingdom of Italy dissolved, and much of Italy became ruled by independent city-states. Florence, the capital of Etruria, eventually was made an hereditary Duchy in the House of Medici. It developed into the Grand Duchy of Tuscany, which was ruled first by the Medici and then later by the House of Habsburg-Lorraine. The Kingdom of Etruria was founded by the Emperor Napoleon in 1801 as a successor state to the Habsburg Grand Duchy of Tuscany to compensate the House of Bourbon-Parma for loss of their ancestral lands. The Habsburg Grand Duke was compensated with the Electorate of Salzburg. In 1807, Napoleon annexed Etruria into France. After Napoleon's exile to Elba, a new Grand Duchy of Tuscany was given to the House of Habsburg as an independent State. Bourbon-Parma received the Duchy of Lucca temporarily until the death of the French Empress, who had been given the Duchy of Parma. The House of Bourbon-Parma eventually returned to their ancestral lands, and Lucca was annexed into the Grand Duchy of Habsburg. The Grand Duchy itself was later annexed into the Kingdom of Sardinia, which became the Kingdom of Italy after the unification of the Italian peninsula under the House of Savoy. After the Second World War, governance of the territory passed to the newly-formed Italian Republic. 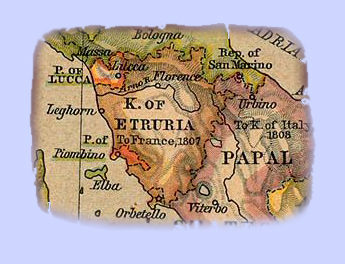 The titular Kingdom of Etruria was restored via the Holy Roman Empire to the Germanic-Franco-Italian House of Johnson-Etruria-di Daniell as descendants and successors to the earlier Margraviate of Tuscany. The direct paternal line originated in southern Denmark/Jutland and then migrated to Normandy, France, and the British Isles. The descent of the House of Johnson-Etruria di Daniell includes the houses of Bourbon, Anjou, Altavilla-Sicily-Naples (Hauteville), Arles, Ivrea, Flanders, Welf, and Castile y León. Their noble and burgher ancestors came to the New World colonies in the 17th and 18th centuries, where they continued the ancestral legacy of leadership, service, and distinction. 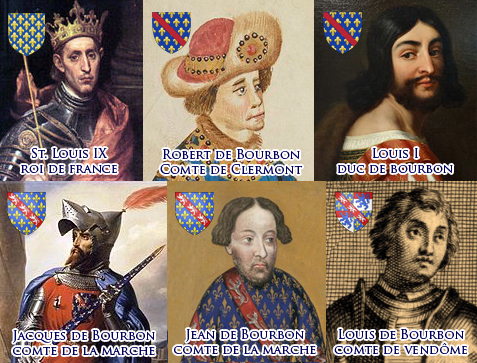 They also hold the Merovingian title of Count of Sainte Animie in descent from the ancient Counts of Gévaudan and Toulouse. The House is also a member of the Union of Byzantine Dynasties. Throughout history, members of the House of Johnson-Etruria-di Daniell served in the military with distinction. The current family follows in ancient footsteps of ancestors who conquered Sicily from the Arabic eminarate. Later in history, Walter, uncle of the present Grand Prince, fought in the campaign to liberate Italy from the Nazis. He later participated in the D-Day invasion of Normandy, receiving the Croix de Guerre with Palm from France, and the invasion of Okinawa. Other members of the family throughout its history have served in the military around the world with distinction and have made contributions in many fields of endeavor. The territory of Etruria dates to the ancient Etruscan civilization and includes the history of the Medici Republic and Duchy of Florence, as well as the Gallo-Roman heritage of the Houses of Medici, Bourbon-Parma, Johnson-Etruria-di-Daniell, and Savoy. The Kingdom of Etruria in the Holy Roman Empire today is a titular ecclesiastical kingdom under the Old Holy Roman Church of the English Rite with strong cultural links to the Etrurian region. While spiritual and temporal authority are maintained, administration of government in the region today is vested in the Republic of Italy. Its primary purpose is the preservation of the chivalric and noble traditions, both spiritual and temporal, of the Holy Church. Inclusions on the Quaternion Eagle of the H.R.E.